About Engineering & Industry Inc.
E & I Inc. is currently providing adhesive and sealant solutions for the automotive manufacturing industry. E & I Inc. has been located in Tallassee, AL and been supplying to Hyundai Motor Manufacturing of Montgomery and its suppliers since 2004. With the recent addition of Kia Motor Manufacturing of Georgia (KMMG), E & I Inc. is currently expanding to meet our customer's needs. 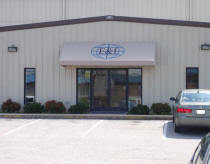 Currently E & I Inc. is a Tier 1 supplier for Hyundia Motor Manufacturing of Montgomery (HMMA) and Kia Motor Manufacturing of Georgia (KMMG). We also supply parts and material directly to other Tier 1 suppliers of HMMA and KMMG. E & I Inc. building entrance.